If only it were going to be warm this weekend! I'm getting a little tired of boots and would love to be throwing on something light and breezy like the above ensemble. 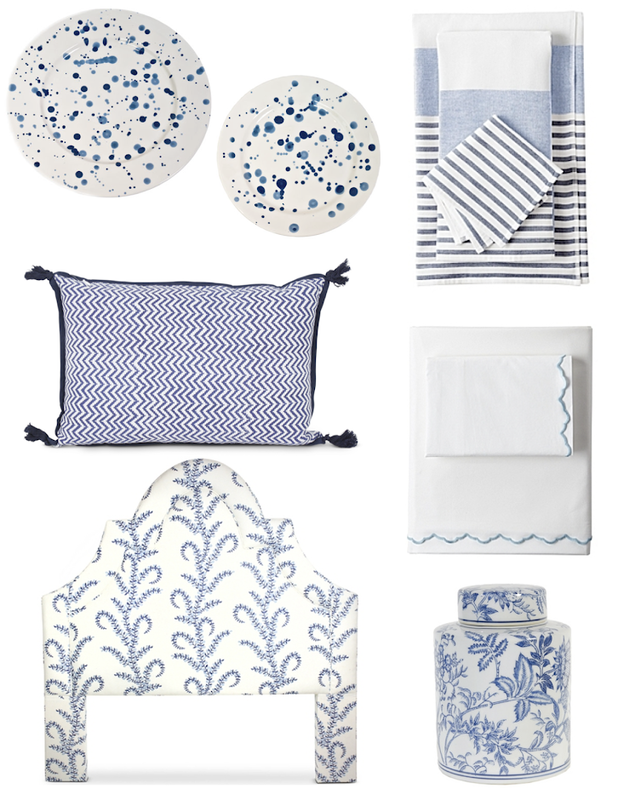 I remain completely smitten with blue and white decor. Here are my latest cravings for the kitchen, bath, and bed. Have you seen The Coveteur's sneak peek of SJP's forthcoming shoe collection? I actually can't beleive this hasn't happened sooner. SJP is synonymous with "Carrie" and lord knows that girl appreciates her shoes! 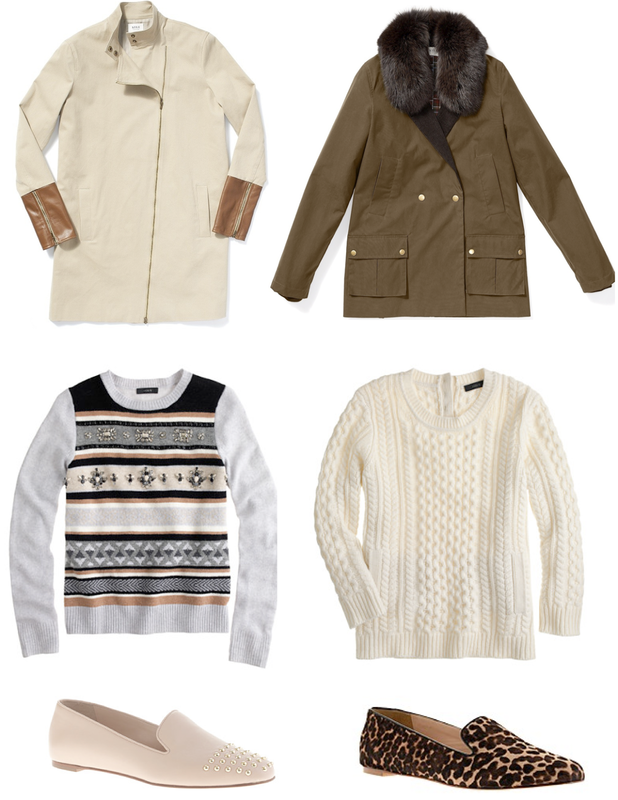 The line will be held exclusively at Nordstrom debuting February 28th and ranging in price from $195 to $485. What do you think? Would you purchase Sarah Jesica Parker's shoes? Handbags will be included too. Check the entire story out here, and you may also like this little behind the scenes video. I spent the past weekend in Maine with my girl Olivia, from O.Style Image. 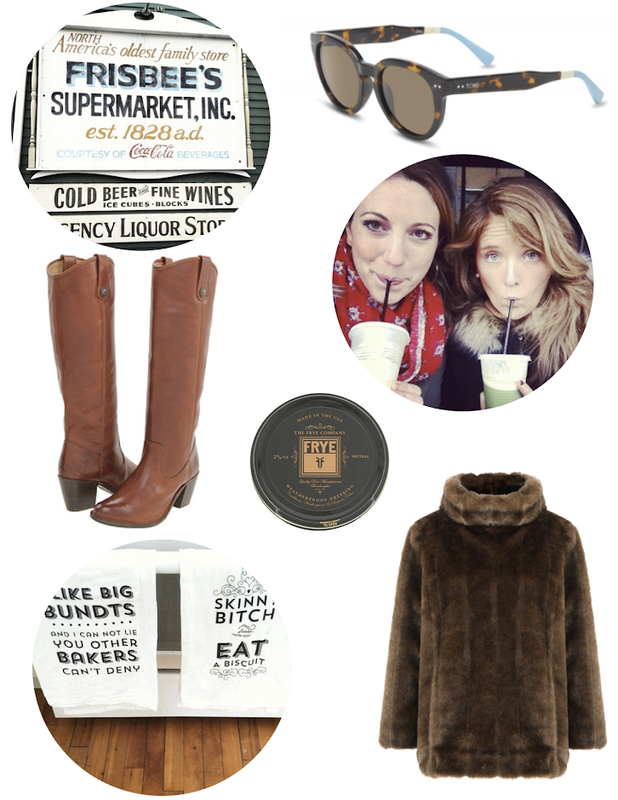 Aside from catching up, eating phenomenal food, and other general shenanigans we usually make time to do a little shopping. I've found some incredible vintage finds while shopping with her and I love that she often gives me that little push that I sometimes need. TOMS sunglasses: I love this company's One for One model for helping others. Proceeds from my sunglasses will help restore someones sight by providing prescription glasses, medical treatment, or sight saving surgery. They have some great styles to choose from- check them out. Frye Jackie Boots: Ok, these are an investment but so incredibly worth it. I've had my Frye Campus Boots for about 10 years and they are still going strong. I acknowledge that I am a little tough on my boots but I have literally worn through the sole of the last three pairs I've had (which were not Frye's). So this purchase was a must in cognac and on sale! I also picked up a tin of the Frye waterproofing and leather conditioning cream. It's so easy to use and the cream is clear which makes it versatile. Green Juice: That silly picture is my first green juice experience. It had kale, cucumber, lemon, ginger, and an apple. I actually really liked it and it's gotten me back on board with making my own protein shakes. I'm storing my protein shake powder, fresh kale etc. in these glass Ikea jars. Dish Towels: Olivia is actually an incredible baker and I arrived to fresh cookies which was incredible. How cute are these quirky little dish towels that she has? Faux Fur Pullover: This was an absolute steal! I paid $35 and it was originally $200. The moment I saw it I was reminded of the original 2011 version made by Kate Spade. What I love about this version is that the seams are vertical. The original Kate Spade had horizontal lines which aren't as flattering on an already boxy silhouette. If you like it I would definitely check your local store. Olivia picked up this sleek dress on major sale! Love the classic silhouette and she paired it with this belt also on sale! I always love stumbling upon a small space that has big style. 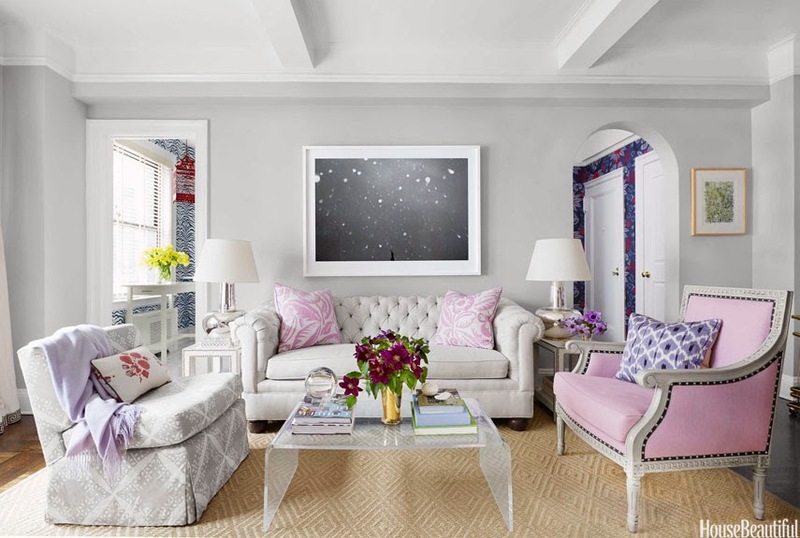 I want to create a warm inviting home that's perfect in every little corner and that's exactly what designer Ashley Whittaker achieved in this New York City apartment. The above 800 square feet are highly styled functional rooms with distinct living areas. Feminine, bold, and playful designs are paired flawlessly with more traditional pieces. Some areas serve multiple functions- the desk can easily transform into a formal dining space. I have to say that my favorite area is the entryway and I enjoyed reading Whittaker quote Billy Baldwin in her design approach: "Billy Baldwin said you should start with a dark space and work your way through the apartment, lightening rooms as you go." 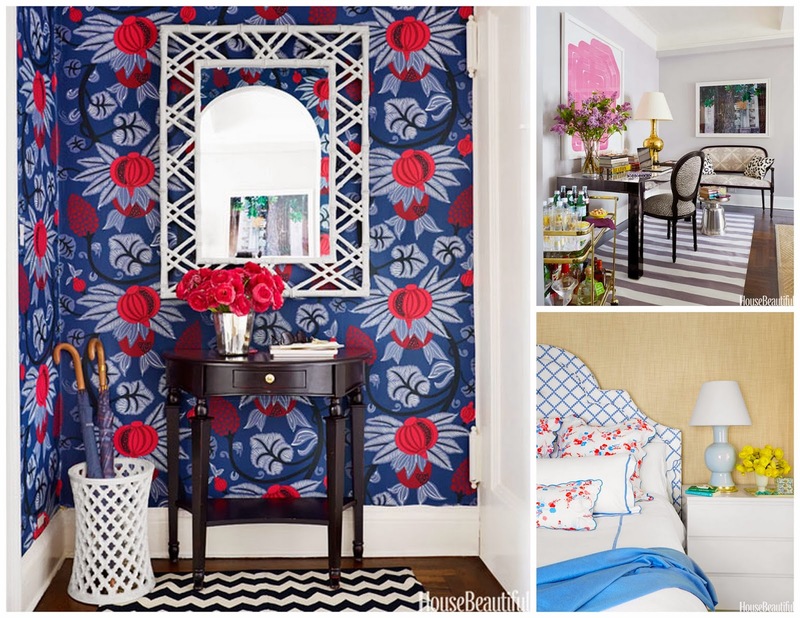 Check out the entire article and full set of images and sources on House Beautiful. Do you shop Boden? There are great buys to be had at very reasonable prices. My new work environment is decidedly less dressy this year. Most people would probably welcome this change with open arms but I love my little heels (especially since I'm only 5'3") and I always go for a pointed toe since it elongates the leg. 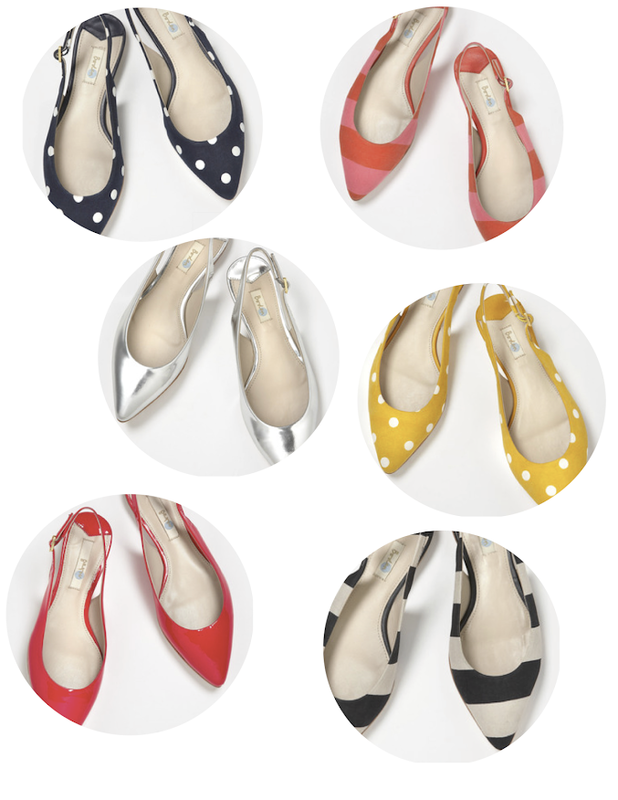 These pointed slingback flats are exactly what I need for spring! No heel but they still feel feminine and stylish. They're $108 and come in ten different colors and patterns. I think they are perfect for cropped pants (like these), skirts, dresses, and even boyfriend jeans on the weekends. But seriously.... I wasn't kidding about needing to take a vacation this year. And along comes the ULTIMATE giveaway from Bri of Design Love Fest. Six days in Mexico!? Yes please. I instagrammed my essentials here as part of my entry for the giveaway. Above are a few other items I wouldn't mind tossing in my bag (shop below). Head over for your chance to win too. Good luck! 2. At $37.90 this dress is an absolute steal! 3. I'm a visual and tactile person which means I like to write down events and thumb through my calendar instead of documenting it electronically. This little date book is the perfect size to carry around. 4. Pink unmentionables... need I say more? 5. Style steal! $69.99 for this pink and gold tufted ottoman. It also comes in lavender and If I didn't already have stools I would get two pink ones immediately. I'm also eying this tufted bench. 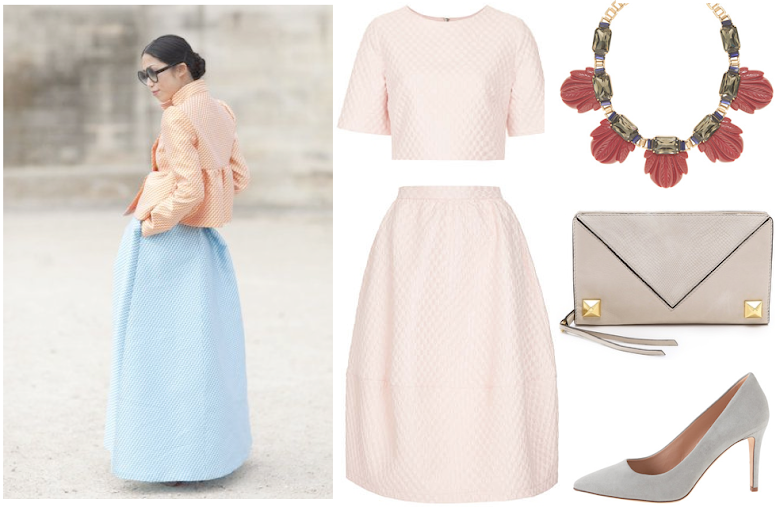 The moment I saw the above skirt and top combo I was instantly reminded of this street style shot from Paris fashion week. I love the idea of a billowing silhouette with textured fabric and soft hues. I would totally rock this look (after about a thousand sit-ups). Would you? 1. I'd like to continue to upgrade items in my kitchen and am thinking gold flatware like these might be my next purchase. 2. I just purchased this otami quilt from Mexico and am dy-ing for it to arrive. I'm hoping to use it as a pop of color on my bed. 3. I still need curtains for my living room but have yet to find a pair that I like. To celebrate my move I had two slipper chairs and a pair of stools reupholstered over the summer. I'm trying to spend wisely and not invest too much in things that won't easily transfer to a "forever home". Custom window treatments certainly fall into that category (been drooling over this fabric). I just found the above fabric with a moderate price tag (feels very Sister Parish, no?) and am now reconsidering the idea of having curtains made. 4. I love this image and the moment I saw it I thought about how I've fallen so behind in discovering and enjoying new music. A friend played this cover of No Diggity by Chet Faker for me over vacation. I love it and need to get back in the loop. 5. VACATION. I don't really make resolutions but this year I really want to take a legit vacation.